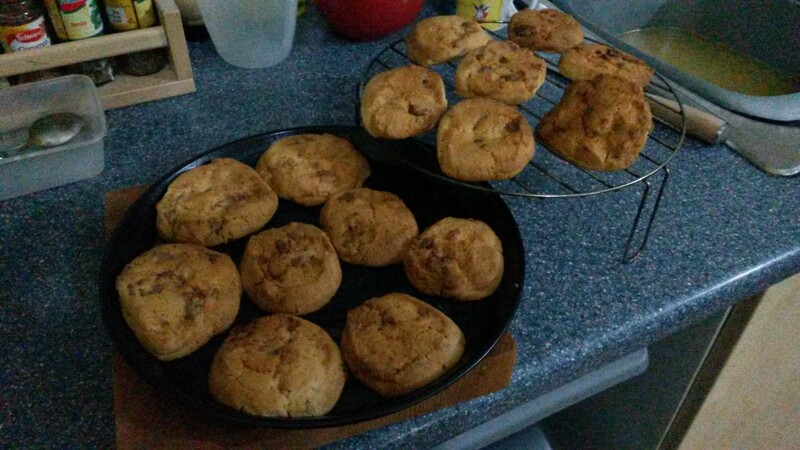 It was sometime last week that I attempted a slight variation on the chocolate chip cookies I’d made previously, which were so soft you had too tear them apart as they would not snap like biscuits. That’s not necessarily a bad thing but I still wanted to try and alternative approach that might give a more ‘expected’ result. 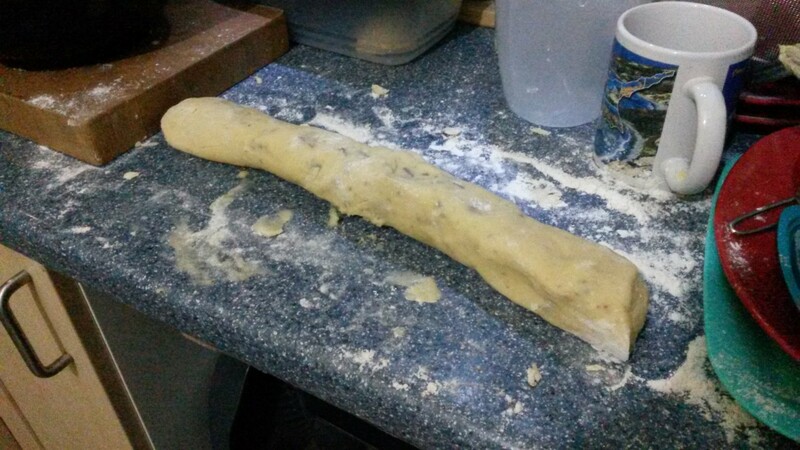 Once the dough had been formed, I followed instructions to roll it up in the a sausage shape, wrap it in cling film and place it in the fridge for an hour. So many baking and cook books state that you should “roll it in to a sausage” but there rarely inform you on the ideal length… So, rolled mine to about the same length as the round baking trays that came with my halogen oven. After an hour in the fridge, the sausage was removed, unwrapped and sliced up in to 20mm (¾in) thicknesses – I think I used my thumb or finger as an approximate gauge for each cut. I managed to fit my entire batch comfortably across two greased trays. 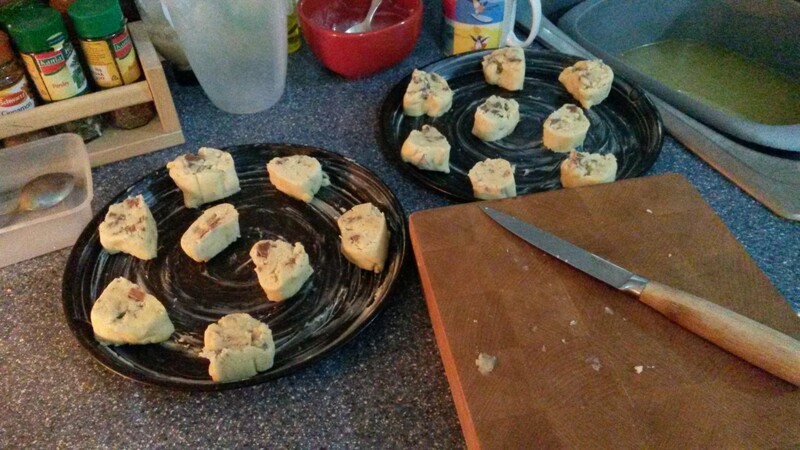 I hadn’t bought any chocolate chips in the previous week’s shopping and I’ve still yet to replenish my supply since… So, I grabbed a 100g bar of chocolate and chopped my own (of course, these were added before the dough had been formed). End results were far better than expected. 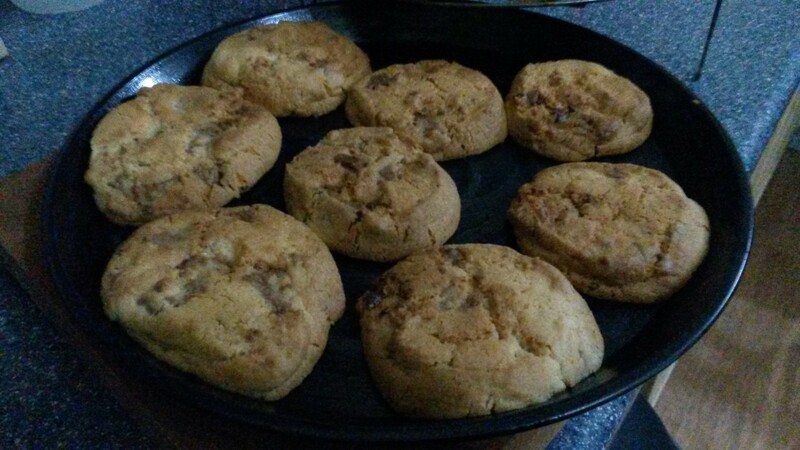 These cookies didn’t ‘spread’ as they baked in the halogen oven (temperate of 160°C) and that rolled-sausage-then-fridge-time trick left them soft without being soggy; firm without being biscuits. These were the best cookies that I had baked to date and, again, I used regular granulated sugar in place of caster sugar.